What is a Smart Warehouse? | Affiliated Warehouse Companies Inc.
Posted August 30, 2018 & filed under Miscellaneous. Warehouses used to be little more than big buildings with rows and rows of shelves tucked inside of them. The most sophisticated pieces of equipment in most warehouses were forklifts, and workers didn’t need to know much about technology to hold down warehouse jobs. Today, however, warehouses are totally different than they were even just a few years ago. The “smart warehouse” has become very popular, and it’s helping companies do business in a whole new way. 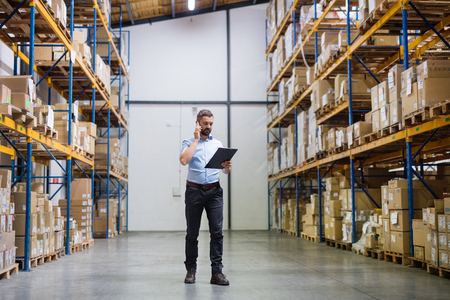 Instead of having to manually perform tasks like manage inventory and pick items from different areas, smart warehouses are making it possible for companies to rely on technology to get things done. While smart warehouses are still under development and evolving by the day, the thought is that smart warehouses are going to allow companies to receive orders automatically, confirm that the items in those orders are in stock, and then fulfill orders using robots that can take care of everything without help from a human. This entire process will be monitored by a network of sensors that will keep things moving along smoothly, which will allow human workers to focus on making the process as efficient as it can be. Ideally, smart warehouses are going to provide companies with the real-time visibility they need to optimize their processes and make changes on the fly to improve speed. They’re also going to enhance safety and security within warehouses and eliminate a lot of the human error that could occur. In the end, smart warehouses should be able to save companies time and allow them to make more money while satisfying their clients and customers. Affiliated Warehouse Companies is on the cutting edge of the warehouse industry and looking forward to seeing how smart warehouses take shape and help companies. Whether you need a smart warehouse or something simpler, we can find the right space for you. Call us at 732-739-2323 today to track down a warehouse for your company in your area.